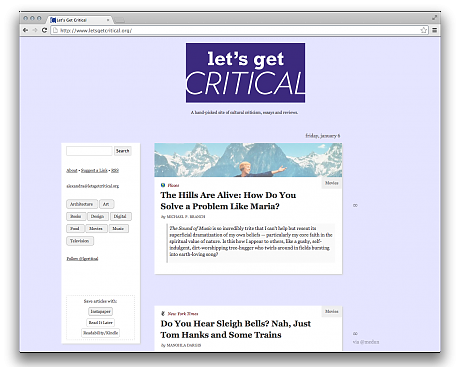 Let’s Get Critical was a collaboration between Alexandra Lange and the editors of Longform.org. The site, active from September 2012 to February 2013, sought to apply Longform’s model for curated non-fiction articles to cultural criticism and essays, creating a one-stop shop for the best of new and classic arts writing. It was edited by Lange, and posted daily links to movie reviews, actor profiles, book criticism, designer interviews and television history. In an age of shrinking culture sections, it sought to create an opinionated center for dispersed criticism of both high and pop culture. Ultimately, it failed to generate enough independent audience, and was folded into the Longform mothership as the Arts & Culture tab.